Home / Entertainment News, Videos / When OKOTH OBADO goons unleashed violence and attempted to kill JOHO in Migori , this guy is ruthless mafia ( WATCH VIDEO). When OKOTH OBADO goons unleashed violence and attempted to kill JOHO in Migori , this guy is ruthless mafia ( WATCH VIDEO). 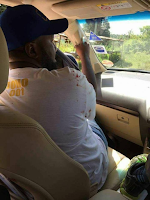 Sunday, September 9, 2018-Last year, Mombasa Governor, Hassan Joho, escaped death by a whisker when goons associated with Migori Governor, Okoth Obado, attacked his convoy when he had gone to drum up support for his rival, Ochilo Ayako, during a political rally. Joho and a secti0n of ODM politicians were supporting Okoth Obado’s opponent, Ochilo Oyako, during last year’s election. Goons sent by Okoth Obado attacked Joho and other ODM leaders when they were campaigning for Achilo Ayako. A bodyguard attached to Joho was shot and wounded during the scuffle when he was protecting him from the goons who wanted to end his life. Obado, who has been put on the spot over the death of Sharon Otieno, is known to be a violent man who deals with his opponents ruthlessly. Watch this video and see how his goons unleashed violence and attempted to kill Joho and other ODM leaders.